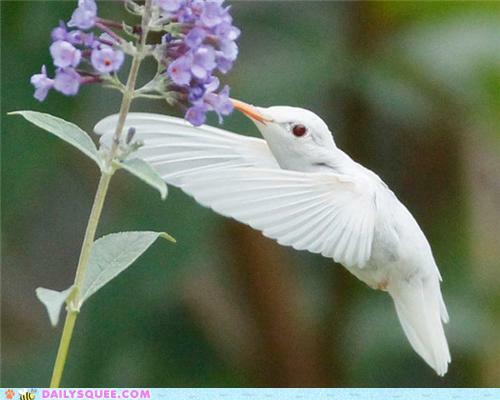 A Rare treat… an albino hummingbird. Something that is seldom seen and almost NEVER photographed. 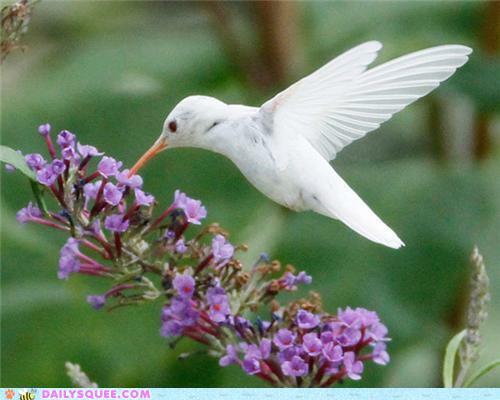 Fifteen-year-old photographer Marlin Shank was fortunate enough to capture several images of a rare albino ruby-throated hummingbird while in a park in Staunton, Va. This is another example of albinism. Where albinism is a condition where the animals has less than normal pigmentation, melanism is a condition where the animal has more than normal pigmentation or melanin. I have always loved Halloween. Even now in my older years I still enjoy decorating my front porch with all kinds of Halloween items, and dressing in a spooky costume. I get a kick out of entertaining the children who come to my door playing “trick or treat”. They always leave with a treat, and I have never had a trick played on me. I never really knew the history of this fun time called Halloween until I met some people who were totally against this “pagan holiday”. This prompted me to do some research on the topic. I learned that Halloween means “hollowed” or “holy evening” because it takes place the day before All Saints Day. Many superstitions and symbols are connected with Halloween. The Irish have a tale about the origin of the Jack-o’-lanterns. They say that a man named Jack was unable to enter Heaven because of his miserliness. He could not enter Hell because he had played practical jokes on the devil. So, he had to walk the earth with his lantern until Judgment Day. The Druids believed that on Halloween, ghosts, spirits, fairies, witches, and elves came out to harm people. They thought that the cat was sacred, and believed that cats had once been human beings who were changed as a punishment for evil deeds. This belief has led to the present-day use of witches, ghosts, and cats in Halloween festivities. Notwithstanding all this history about the dark side of Halloween, I decided to start a neighborhood celebration with the help of several neighbors. Several years ago four families joined with my wife and me to have a Halloween celebration at the end of the street in front of our home. One family donated a black kettle, in which we put dry ice and water, then built a fire all around it. The effect was startling. Another neighbor, a carpenter, built a wooden coffin, complete with hinged door and padded interior. 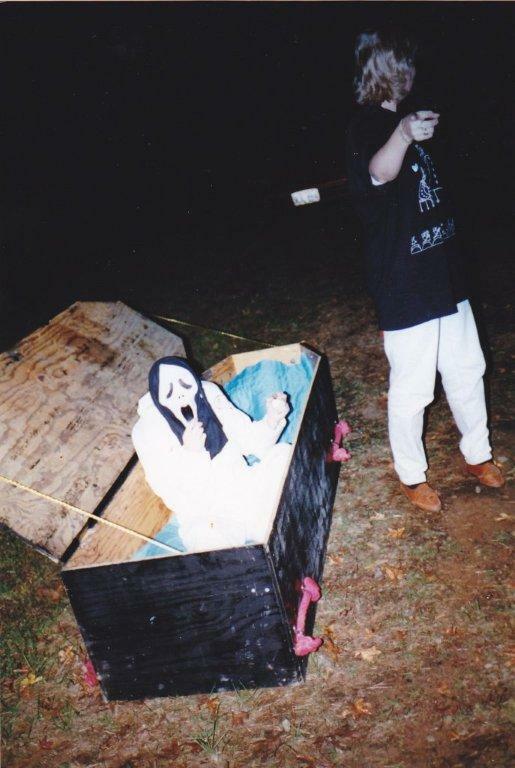 A “mummy” inside this coffin was a sure scream-getter. A teenager in the neighborhood furnished a chain saw (without the chain) and an appropriate mask, and would run out of the darkness with the saw roaring. Small kids would make a hasty retreat. Apparently they were aware of the “Chain Saw Massacre” movies. 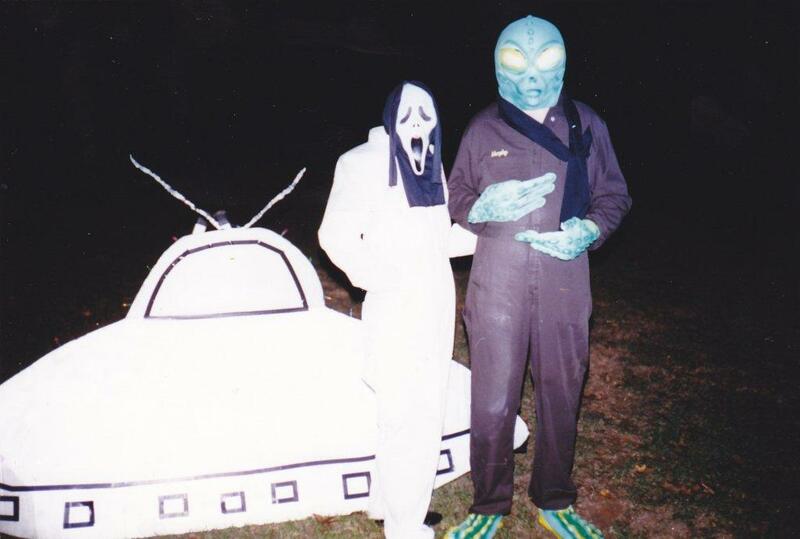 One Halloween I made a small UFO complete with silver paint and flashing lights, while sporting an alien costume. All types of ghosts and goblins have attended our celebration, as have Dracula, the Devil, a clown, and a mummy. All contributed to our fun. A large table was set up and loaded down with candy, fruit, and drinks. All the kids were given treats. After a couple of years of this “end of street celebration”, we were attracting children of all ages, along with the parents of the very young. A large crowd usually attended these events. After all the kids had left, the participating neighbors would all gather at my house for hot dogs and hamburgers. Unfortunately, the neighborhood kids grew up and lost interest. Gradually there were not enough participants to keep going, so we stopped the Halloween celebration at the end of the road. However, if you stop by my home in the Pine Acres Sub-division on any Halloween evening, you will find my front porch and lawn fully decorated, my brother and his wife in their costumes, still giving the children a “scare” as we hand them candy. I feel we need to continue this practice. What if the Druids were right? A Waller County game warden and a Harris County game warden were patrolling Waller County when, just before sunset, the wardens heard multiple shots coming from a wooded area. They made their way through the trees and observed three dove hunters having a great hunt, but not retrieving the doves that fell into the woods. If they had, they would have found the two game wardens. After the wardens hid in the brush for about 30 minutes, one of the hunters announced to his friends, “I am done. I have 23.” The wardens looked at one another to make sure they both heard the same thing when the hunter yelled again, “I am done. I have 23 doves.” The wardens took his word for it and announced their presence, separated the hunters, and discovered one with 20 doves, not 23. The other two hunters were within the daily bag limit. One of the wardens walked the hunter who was over his limit back to the hunter’s truck to retrieve his license. At the truck, the warden observed dove feathers that appeared to be from earlier in the day. The warden made a statement to the hunter, “This morning’s hunt was good, wasn’t it?” The hunter promptly agreed that it was really good and then realized what he had done, and said, “Oh, no.” He admitted that he had also shot a limit in the morning. Citations were issued for exceeding daily bag limit and failure to retrieve game. A Washington County game warden received information about a possible hunting violation from a local cyber crimes unit. The warden interviewed an individual that had posted a photo on his Facebook page of six cattle egrets that had been killed during a dove hunt on Labor Day. On the subject’s Facebook page, it was noted that only three doves had been killed because the egrets got in the way. The subject gave a statement stating he and three other individuals had shot the egrets. The warden obtained information on the other three hunters and the location of the violation, which occurred in Austin County. With assistance from an Austin County game warden, statements were obtained from the other three hunters. Citations and restitution pending on all four subjects. Armed only with a tip about a website from an informant claiming an outfitter might be baiting a dove field, Hopkins and Titus County wardens pieced together an investigation that led to several citations. After locating the hunting operator online, the wardens called to book a hunt. Imagine the outfitter’s surprise when his new customers showed up in game warden gear. The operator admitted to spreading three yards of wheat seed down the middle of a 300-acre pasture with a tractor and frontend loader. Citations were issued for baiting and placing bait to attract. Two Van Zandt County game wardens were contacted by a local ranch owner concerning a unique picture that was taken on his game camera. The photo showed a woman, with a very distinct tattoo, holding a baby white-tailed deer fawn. The time stamp on the photo said that this woman was on the ranch property in May on the same date and time the ranch was burglarized and several firearms, hunting equipment and a Polaris Ranger were stolen. The wardens then conducted a press conference seeking help from the public in naming the woman in the photograph. The wardens soon received multiple Operation Game Thief calls that matched the woman in the photo with her name and the warden’s received a tip to her current location in Smith County. The wardens, accompanied by a Wood County game warden, went to the location and found her. After being interviewed, the woman confessed to stealing from the ranch and identified her accomplice. The investigation led to a substantial amount of stolen items being recovered, including three guns and the missing vehicle. The case was turned over to the Van Zandt County Sheriff’s Office, where burglary of a habitation, trespass and unlawful use of a motor vehicle were filed on all subjects. Two Val Verde County game wardens investigated mountain lion sighting reports that were called in from the outskirts of Del Rio. The first investigation was for a horse that allegedly had been attacked and the second involved a herd of goats. No indications or evidence was found that a mountain lion is roaming and feeding on pets in Del Rio. The wardens also ruled out a Chupacabra. Two Val Verde County game wardens responded to a call from a landowner who said there was a bear trying to break in to her storage building. Apparently, the bear was hungry, as it was trying to get to a bag of cat food inside. When the bear ignored the homeowner’s yells, she ran back into her house and retrieved her shotgun. A shot was fired in to the air and the bear ran off. The wardens provided the homeowner with information to try and prevent another encounter. Two Taylor County game wardens received a call from a landowner claiming bird shot was falling on their house and even struck their horse. The wardens went to the residence of the landowner and while getting a statement from him, bird shot fell on the wardens. They located the shooters and had a very serious talk. A Milam County game warden and Bell County game warden were patrolling Milam County on opening day of dove season when they located a group of hunters right before sunset. The wardens waited to see if the hunters would continue shooting after sunset, and after waiting in the brush for a while, the wardens made contact with them. While among the hunters, the wardens found three men and two shot guns, one a 12-guage, the other a 20-gauge, and spent shells everywhere. The problem with this is that only one man admitted to hunting. 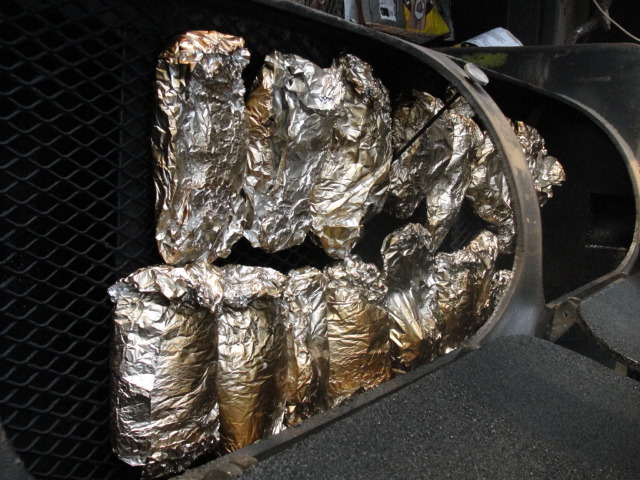 One warden asked one of the non-hunters why he had so many shells in the back of his truck. The man said his girlfriend was shooting beer cans. When the warden asked where she was shooting from and to see the cans, the man said she was shooting from 15 yards away and had missed every time. The warden called his bluff and the man later admitted to hunting and citations were issued. Two Refugio County game wardens were checking teal hunters in the northern part of the county when they came across one hunter in particular. The hunter produced his bag and told one of the game wardens that he had bagged the biggest teal duck he had ever seen. The warden advised the hunter that the reason the duck was so big was because it was a mottled duck. The hunter was filed for lack of hunter education course. Two Refugio County game wardens finished checking dove hunters and headed over to Bayside to see how the fishermen were doing. Two subjects, who were pulling their boat out of Copano Bay, advised the wardens that they had one gar. One subject did all the talking while the other seemed in a hurry to get things loaded up. One of the wardens asked the fast-moving subject if he had a wedding to get to. The subject said no, so he asked if they had caught any other fish. The subject stated they had a redfish that was almost 28 inches. When the warden checked the ice chest, they saw a 26-inch redfish. The warden asked the subject what he was measuring with and if they had any other fish. The subjects admitted to having two more redfish, one at 29-inches and the other at 30-inches. The fast-moving subject advised the game warden that they would go ahead and tag their fish. The warden advised both subjects that tags would be filled out after both subjects signed their citations. The hand of the diligent shall bear rules but the slothful shall be under tribute. Proverbs 12:24. We all have things that irritate us! These are usually called pet peeves. If I do have a pet peeve, it would be laziness. When I was growing up, there was no room in my life to be lazy. Our family had a set schedule for everything for daily living. We got up at a certain time and we went to bed at a certain time to make the next day’s activities go smoother. We had breakfast, dressed for the day, straightened up the house, and washed the dishes before we went to school or to work. It is very irritating to me when folks around me fail to be on time or have any regards for other people’s time. Some folks stay up late until the wee hours of the morning and then they don’t want to go to work or fulfill their duties. When a family does not have a routine for daily activities, chaos occurs. No one knows what time it is or where they are supposed to be at a certain hour. Some people are too lazy to get up or put on their clothes or they want to lay in bed until noon time and then they waste the morning which puts them behind the rest of the day. The Bible speaks about slothfulness and tells us to not be slothful. The book of Proverbs reminds us that if we are too lazy to work then we don’t have a right to eat or ask God to bless our laziness. Some people are too lazy to read their Bible or too lazy to go to church, or too lazy to do anything for others or to be a friend. Lazy people make poor employees. They just slide by and do the least amount of work possible. They not only waste their employer’s money, they make it rough for their co-workers who have to pitch in and do their uncompleted work for them. We can all be thankful that God put everything on a schedule. There is time for everything. Life would be happier when we live every day on the bright side and the right time. Can you catch your buddies’ limit of fish? Whose fish is that? Understanding the laws behind group limits! You want to have a fish fry for friends and family, so you’re out on the lake with a buddy to catch a mess of catfish or white bass. But it’s one of those days where you can’t catch a cold, and your friend is pulling in fish left and right. Can you let him catch both his limit and yours? According to Grayson County Game Warden Dale Moses, the law is pretty straightforward with the answer, but enforcement is difficult. Though each person has their own limit, anglers are allowed to keep fish in a single cooler, or stringer. But what about anglers who give their catch to others nearby, and then keep fishing? 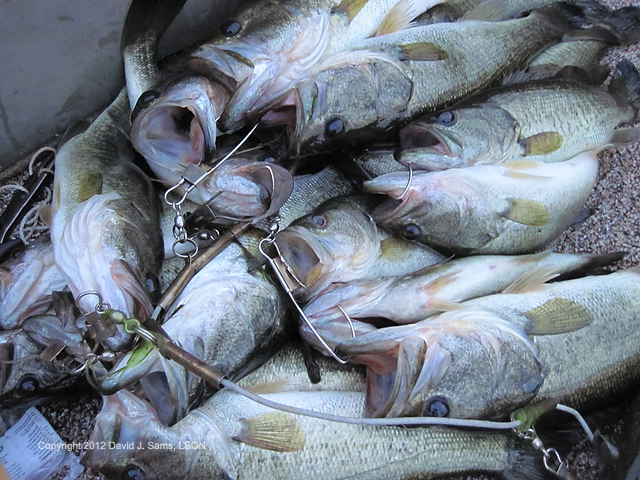 Finding out if an angler is sharing fish is not easy, or common, for wardens. If a warden does observe an angler catching fish and giving them to others, a ticket can be written for going over the daily possession limit, which can carry a $160 fine, plus the repossession of the fish. According to the Texas Parks and Wildlife Outdoor Annual, doing anything short of returning the fish directly back to the water counts toward each individual’s limit. Another situation where the sharing of fish comes into play is the party boat fishing charters along the coast, where a multitude of anglers are all fishing the same location. Katey Doleman, office assistant and reservation coordinator for Williams Boat Service in Galveston, said they have a system to stay within the law. 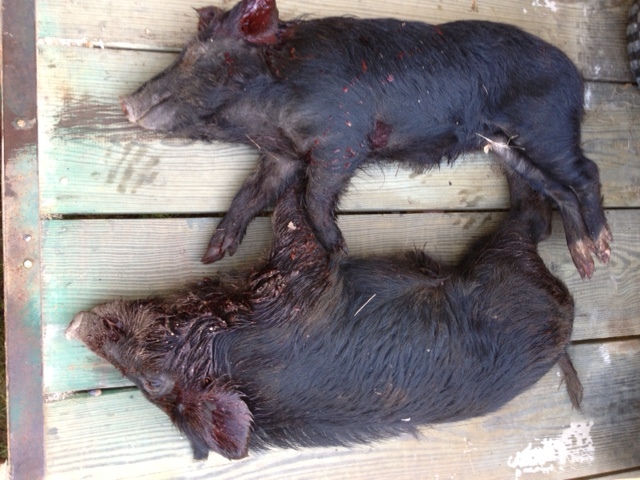 These little fellows should not have stopped by our hog trap. they will be cooked for grand-kids. 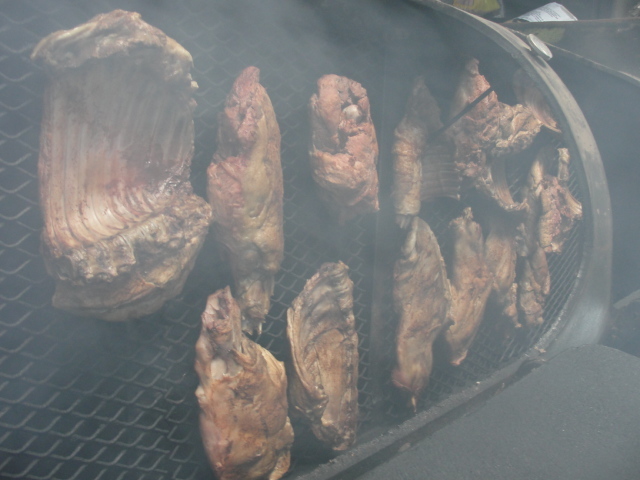 to smoke the meat for about one hour. Once frozen, the meat goes to the homes of the grand-kids. Rarely does an opportunity like the one Clara and I recently experienced come along in our lives. It would not have happened to us without the loving generosity of a friend and classmate of Clara. Martha Fuller Turner graduated from Hemphill high school in 1958, a member of Clara’s graduating class, and one of three buddies that she had during that time. Martha married a San Augustine native, Keith Turner, in 1962, and taught first grade in our school system for a short time. Martha and Keith moved around while attending college and eventually settled in Houston. Martha decided to go into the real estate business in Houston around 1981 with only one house to sell. As is often stated, the rest is history. Unfortunately, Keith died in 1986 leaving her to run the business by herself. so honored in its fifteen-year history. Several months ago, Martha called Clara and asked if she would come to Houston and participate in a biographical movie being made about Martha’s early history. Since she and Clara had been friends since elementary school, Martha wanted Clara to participate in the filming process. We agreed to do this and Martha housed us in the St. Regis hotel where we were definitely out of our element. I noted the cost of the room to be $750 per night. I urged Clara to take a look at the card on the door, “We’ll never stay in another room like this”, I ventured. To add to our adventure, we ordered up room service for dinner, and breakfast. I soon discovered that the $2.00 tip doesn’t cut it in a hotel like this one. Martha sent us free tickets to the event held on the night of September 20th in the Houston Museum of Natural Science building. It was a black-tie gala including a silent auction of paintings by local artists, and a cocktail party. Ambling through the auction with a glass of water with lime, I evaluated all the paintings. Many of them looked much like something a kindergarten student would create, and they required a minimum bid of $1,000 each. I guess I just don’t appreciate modern art. But, I was rubbing elbows with the elite of the elite of Houston – doctors, lawyers, and moguls of all kind. Surely some of that culture will rub off on me because I was in a black tuxedo with a red cummerbund. No one even suspected that I was from a little country town in deep East Texas, one of the few small fish in this large pond. All 350 of us were ushered into the huge I-Max theatre to hear congratulatory speeches and watch the prepared movie honoring Martha on the big screen. There Clara was, larger than life upon the screen, making complimentary comments about her friend, Martha. The film lasted about twenty minutes after which Martha made her acceptance speech, brief but impressive. A mini-bus transported all her close friends back to the St. Regis hotel where we bedded down for the night. There’s nothing like “roughing it” in such a hotel where “the help” hovers around you catering to your every whim, for a tip, of course. Martha had planned a breakfast the next morning for all fifteen of us in the “red room” of the dining area of the hotel. So there we were swimming with the big fish once again dining on a breakfast fit for any king. A large plate filled to the brim with scrambled eggs, two strips of bacon, two sausages, potato wedges, a half tomato baked and stuffed with something, coffee, juices, and topped off with a salad plate loaded down with fresh berries, orange slices, pineapple slices, and kiwi. My typical breakfast is a bowl of Cheerios and a cup of coffee; therefore I had to do some adjusting to minimize the shock to my digestive system. Then it was time to check out and head north back to East Texas. The most beautiful words of all were uttered by the clerk at check-out, “Mr. Murphy, your bill has been taken care of.” A pregnant pause. “Does that include the parking for my car?” I queried. “Of course, Sir. Have a great day.” It just does not get any better than this. Thank you, Martha Turner, for your hospitality. We were quite pleased to be with you on the night of your prestigious award, and very happy to have been a part of the program. We are hoping that you win even more awards in the future. We will be happy to go down to Houston and help you out again. 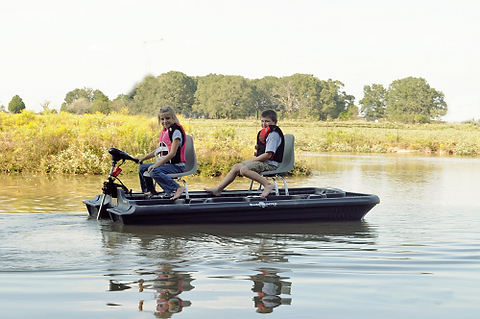 HOP IN: Gracie Standridge takes her brother Wyatt for a ride in the boat she won at the Bluegill Family Fishing Tournament Sept. 29 at the Texas Freshwater Fisheries Center in Athens. There’s something about winning a boat that makes fishing in the rain worth it. Mark Standridge’s daughter, 8-year-old Gracie Standridge, toughed out the conditions and held the lucky ticket to win a boat and trolling motor at the Bluegill Family Fishing Tournament Sept. 29 at the Texas Freshwater Fisheries Center in Athens. When the tournament ended, the Standridge family team had finished in the upper teens of contestants. But when the grand prize drawing was announced, Gracie was the winner. Gracie has been happy to share her success with others in her family. Val Verde County Game Wardens Mike Durand and Aaron Willoughby were kept busy over the weekend of Sept. 8-9 investigating reports of mountain lions roaming the outskirts of Del Rio. The first investigation was for a horse that allegedly had been attacked and the second involved a herd of goats. Wardens found no indications or evidence that a mountain lion is roaming and feeding on pets in Del Rio. The wardens also ruled out the chupacabra. That rash of mountain lion reports may well have been triggered by a Sept. 5 incident in which Val Verde County Game Warden Mike Durand responded to a call from the Del Rio Police Department concerning a mountain lion sitting on a hood of a car in downtown Del Rio. The lion had been cornered in a building and the PD wanted to know if it was OK to shoot it. Because of the lion’s location and behavior, it was dispatched by the Del Rio Police Department. Van Zandt County Game Wardens Trent Herchman and Steve Stapleton were contacted July 18 by a local ranch owner concerning a unique photograph taken on his remote-sensing game camera. The photo showed a female subject, who had a very distinct tattoo, holding a white-tailed deer fawn. The photograph had been taken in May, on the same date and time the ranch had been burglarized and several firearms, miscellaneous hunting equipment and a Polaris Ranger ATV were stolen. Unable to identify the subject in the photo, wardens conducted a press conference seeking public help in naming the female subject. Wardens soon received several Operation Game Thief calls, all of which identified the woman in the photo, giving her name. The pair of wardens also received a tip concerning the suspect’s location in Smith County, and went to that location accompanied by Wood County Game Warden Derek Spitzer. Wardens found the subject at the residence and questioned her. She confessed, and identified her accomplice. The investigation led to a substantial amount of stolen items being recovered, including three guns and the Ranger ATV. The case was turned over to the Van Zandt County Sheriff’s Office for prosecution, where burglary of a habitation, trespass and unlawful use of a motor vehicle were filed on all subjects. Cooke County Game Warden Darla Barr was checking for dove hunters on the Corps of Engineers public hunting areas when a vehicle approached, stopped when it saw Warden Barr’s vehicle and started to turn around and leave. This piqued Warden Barr’s curiosity, so she motioned for the vehicle, which held two occupants, to continue her way. The driver advised that he really wasn’t dove hunting even though he had a fully loaded shotgun shoved down between the passenger seat and door. A closer check of the gun found it to have been reported stolen out of Kaufman County in 2006. The driver was cooperative in giving details on how he came into possession of the stolen firearm. The shotgun was recovered and the investigation continues. The passenger, however, was cited for possessing drug paraphernalia. Washington County Game Warden Eddie Hines recently received information on a possible hunting violation from a local cyber crimes unit. Warden Hines interviewed an individual who had posted a photo on his Facebook page of six cattle egrets – birds protected by state and federal law – that had been taken during a dove hunt on Labor Day. The individual had stated on his Facebook page that only three doves had been killed because the egrets got in the way. The subject gave a statement including how he and three other individuals had shot the cattle egrets, information on the other three hunters and the location of the violation, which occurred in Austin County. With assistance from Austin County Game Warden Sonny Alaniz, statements were obtained from the other three subjects. Citations and restitution pending on all four subjects. Game Warden Phillip Wood in July received an Operation Game Thief call concerning a butchered deer that had fallen into the road from a cooler located on top of a Jeep. The caller stated that the deer had been quartered, and that he would remain with the deer until the warden arrived. Also, the caller had followed the suspects’ vehicle and had noted the license plate number and gave a very good description of the suspects. Warden Wood was able to trace the plate to a residence nearby. After a short interview with the driver of the jeep, Warden Wood left the scene and contacted Warden Tim Walker to help with the investigation. Wardens Wood and Walker conducted a thorough investigation, spending several days tracking down individuals who also been involved in illegally taking the deer. The case was recently disposed of in county court with the shooter (driver of the Jeep) being filed on for hunting from a vehicle and waste of game. The other four individuals were filed on in JP court. The shooter received two years probation, 40 hours of community service and his hunting privileges are suspended for two years. He also faces civil restitution charges. The other four received maximum fines in JP court. The court awarded TPWD the firearm used in commission of the offense. Waller County Game Warden Kevin Glass and Harris County Game Warden Mark Bane were patrolling Waller County. Just before sunset on Sept. 7 when they heard multiple shots coming from a wooded area. The wardens made their way through the trees and observed three dove hunters having a great hunt. However, the hunters were not retrieving the doves they downed that fell into the woods. If they had, they would have found two very hot and sweaty Texas Game Wardens. The wardens looked at each other to verify what the hunter had just yelled to his friend. The daily bag limit of doves is 15. The wardens took his word for it and announced their presence, separated the hunters, and discovered one with 20 doves, not 23. (The other two were within the daily bag limit). He admitted that he had also shot a 15-dove limit that morning. Citations were issued for exceeding daily bag limit and fail to retrieve game. While patrolling on opening day of dove season, Cherokee County Game Wardens Eric Collins and Brian Bearden heard shots, attempted to locate the hunters and found an ATV parked in a nearby pasture. Wardens observed grains of milo on the back of the ATV, and also found the grain spread across mowed portions of the pasture. When the five hunters finally emerged from the brush, they admitted to baiting the area two weeks earlier and hunting it that day. Wardens issued citations for hunting dove over bait. As the wardens were leaving, the little son of one of the hunters came up to the wardens’ truck and knocked on the door to tell the wardens that they all had been hiding in the barn. Palo Pinto County Game Wardens Matt Waggoner and David Pellizzari were patrolling for dove hunters on Sept. 2 when they came across a group of people sitting just inside a gate. As the wardens drove up, they observed one subject immediately put his gun down next to his buddy and put his hands in his pockets. After a search of the area and all the people, the wardens found five packages of synthetic marijuana, two empty containers with marijuana residue, and three marijuana pipes. Wardens Pellizzari and Waggoner also found two unplugged shotguns, three subjects without hunter education and one subject without a hunting license. The subject observed putting his gun down next to his buddy turned out to be a convicted felon and was arrested for unlawful possession of a firearm by a felon. Multiple citations were issued to the other violators. All cases pending. Hill County Warden Douglas Volcik received a complaint Sept. 2 from a local hunting guide indicating a couple of hunters were refusing to leave the field and demanding to have their money returned to them because they felt that they didn’t have the opportunity to limit out while dove hunting. 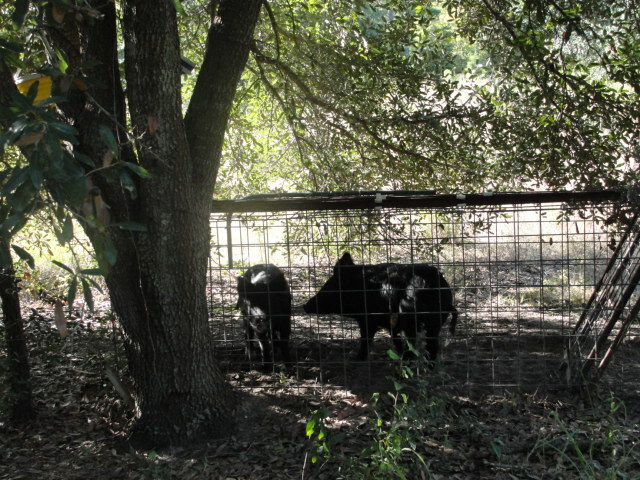 Warden Volcik and McLennan County Warden Michael Serbanic responded, escorted the subjects from the hunting area and issued citations for criminal trespass. Bell County Game Warden Brandt Bernstein checked more than 100 dove hunters opening morning, writing 23 citations to hunters in a single field. Warden Bernstein asked the owner of the property if this was a commercial day-lease hunting operation. The owner stated that to show his appreciation to people with whom he does business, he let them hunt there, and at the end of the day he gave away a shotgun. Because of the landowner’s demeanor and known previous TPWD violations, Warden Bernstein asked several of the hunters in the field what they paid to hunt. They stated they were paying $65 per day. Warden Bernstein finished making his round in the field and filed on the owner of the property for not having the required hunting lease license. Hutchinson/Carson County Game Warden Lance Lindley on Sept. 2 assisted Carson County deputies unpin a farmer who was wedged between a round hay baler door and the baler’s tire. The farmer was changing a broken belt on the baler when a hydraulic hose broke allowing the baler door to slam down on him and wedge him between it and the tire. Warden Lindley and the deputies hooked onto the door with a chain and patrol truck and slowly raised the door, unpinning the farmer who was taken to an Amarillo hospital by EMS staff. Bandera County Game Warden Mark McQueary reports a toxicology test on one of two subjects who drowned last month in Medina Lake had a blood alcohol level of .38, more than four times the .08 BAC Texas law sets as intoxicated. Wardens had assisted in responding to the drowning and utilized the side-scan sonar to locate the subjects. Over Labor Day weekend, Caldwell County Game Warden Joann Garza-Mayberry led an operation on the San Marcos River with Caldwell County constables, constable deputies, sheriff’s office deputies and DPS troopers. The group made arrests and wrote 122 citations that included minor in possession of alcohol, consumption of alcohol by a minor, possession of drug paraphernalia, littering, insufficient number of personal flotation devices, failure to identify and public intoxication. While patrolling the San Marcos River by kayak during the operation, Warden Joann Garza-Mayberry received a call from the sheriff’s office regarding an unconscious subject on the river. The caller reported the male was intoxicated, lost consciousness, fell out of his tube and was under water for a while before bystanders lifted him out of the water. The caller was unable to give an accurate location where EMS could access the victim. Warden Mayberry was able to locate the individual based on landmarks the caller provided on the river. Because of the steep pitch of the river bank where the subject was lying, he was inaccessible to medical staff. Warden Mayberry waded to the victim, placed him on her kayak, transported him to a nearby bank and provided the sheriff’s office the location of an accessible path. A sheriff’s office sergeant was able to access the location given by vehicle, and the two officers transported the male subject by truck to the waiting paramedics who took the man to an area hospital. While patrolling for dove hunting compliance near Lake Alan Henry on Sept. 2, Game Wardens Drew Spencer and Trey Kram responded to an accident involving a boat/truck collision, with injuries, at a private boat ramp. Seems a large ski boat, with occupants, was being backed down the ramp when it came off the hitch and rolled down the ramp at what one bystander estimated was about 50 miles an hour. The loose boat slammed into the grill of a large truck offloading its boat. The occupants of the unhitched boat were slammed around and suffered injuries. Game Warden Kevin Mitchell responded to an OGT call the night of Aug. 24 regarding a subject cast netting undersized blue catfish on Lake Corpus Christi. The caller indicated that the male violator was filleting the fish, placing the fillets into a box, and his wife would hide the box in their vehicle. Upon arrival at the scene, Warden Mitchell noticed the cast net and man and woman as described by the caller. The male subject denied having any fish other than the four legal blue cats in a bucket. Warden Mitchell asked for and received consent to search the subject’s vehicle in which he found 88 fillets in a shoe box. Washington County Game Warden Eddie Hines received a tip in mid-August concerning a subject who had shot and killed an alligator out of season. The subject made an attempt to have the reptile mounted by a taxidermist in Fannin County. Warden Hines notified Fannin County Game Warden Randolph McGee about the illegal kill. Warden McGee located the individual’s residence and contacted Collin County Game Warden Josh Ross who visited the subject’s home and learned that the subject was no longer in possession of the alligator. The subject stated that after learning that the kill was illegal, he went back to retrieve the alligator from his refrigerator and found the reptile was still alive. The subject stated that he then took the alligator down to the creek and released it – well, he “released” it after he shot it in the head with a .22 caliber rifle.